Early June of this year, I ordered five more drives for a client’s Dell PowerEdge VRTX server enclosure, This in addition to the currently installed seven 2TB drives that were humming along just fine. My only request from Dell is that these drives be the biggest we can get, and that they be compatible with the running VRTX enclosure. Simple, right? So we ordered the $8,000 in hard drives, and waited. The drives themselves would kick off a strange saga of failure and support that I can’t recall since working on another blade system, one made by IBM. It’s not very often that I get to do this, and even less likely that I’ll film it for anyone to see. But, in this case, I thought I would take a dead hard drive and make it dead-er. 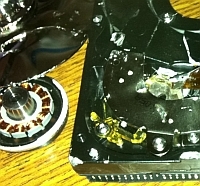 What transpired is a lesson in destruction of a poor IDE drive, or sheer stupidity. So, join me as a take a drive from a (somewhat working state) to an all but certainly unusable state. Please also note, this is not something you should do unless you’re sure it’s okay to possibly destroy data and you wear protective glasses and/or gear. I didn’t wear any protective gear in this video, and it was dumb. Don’t be a dummy like me. 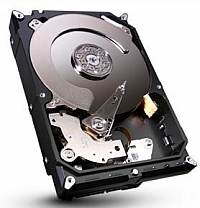 Contest: Win A Free Hard Disk Drive! We love contests. Really, who doesn’t like free stuff? At CWL we’re partial to giving away free tech gear. In 2010, we gave away a Netbook and in 2011, we gave away a Sony eReader. This year, with Hard Drives recently being seriously short supply and rapidly increasing in price – we thought we’d give away a new drive! Read on for more info about this great contest! As always, the lucky winner will be notified by email and then shipped the drive (free of charge). Some restrictions apply, but you get the idea. Winning free stuff a whole lot better than paying for it! Update: This contest has now closed. We thank everyone for the entries! The conventional methods of destroying data on a disk all relate to connecting the drive physically to a computer and using some sort of bootable media with an application on it to destroy data on the connected hard disk in a secure manner. This is the conventional way. I wanted a method that would be faster and more versatile than this, so I attempted to look for a free way to destroy data securely on an externally connected USB disk in Windows. Copyright © CWL. 2019 • All rights reserved.